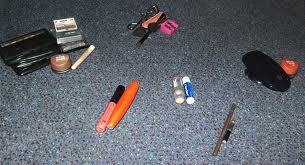 Clean Out That Make Up Bag! Ok, so when I was constructing the new nav bar I added a category called “For The Momma”. Then, I had to come up with things that Momma’s might like to read about. I thought about the things I enjoy, my guilty pleasures, if you will, and added those sections. If you have topics you’d like to learn more about (or do a guest post on! ), please let me know. I know that we all have different interests, but the only ones I could think of were my own. So, any suggestions are welcome. With that being said, I wasn’t sure where to start. I did a little research and just ended up overwhelmed. I decided to scale back, WAAY back, to the very basics. To the make up bag. Or basket. Or drawer, as is my case. Ok, confession: I keep my basics in a drawer. But, I also have my “fancy” stuff. Mostly, it’s my more eccentric colored shadows and liners. Most of it, I should probably throw out, but remember my pack rat confession? It’s a weakness. Ok, rule of thumb: If you have not used it in a year, throw it out. If you can’t remember the last time you used it… throw it out. A year is a long time for something to sit around, cluttering up your space. I don’t know about you, but I don’t have a lot of extra space. If you don’t use it, you don’t need to store it. Throw it out. Another rule: If it has a wand, (mascara and liquid liners especially) throw it out after six months. Three months is better, but I stretch it to six. Make up is expensive! Ok, now go grab your make up bag… I’ll wait. ……………………………………………… Ok, now dump it out. Just turn it over and dump the whole thing into a big pile on the floor (or kitchen table, whatever). Now, separate your bag into categories: Eye shadows, liners, mascaras, lip sticks and gloss, blush, powder, foundation, bronzers, brushes and any other categories your supplies fall into. – When did I last use this? If the answer is “Within the last year”, go to the next question. – How old is this? If it’s older than a year, toss it. If it has a wand and is older than 6 months, toss it. Don’t think twice about it. Just do it. If it doesn’t get tossed, move to the next question. – Ask yourself “When will I use this next?” If you can reasonably give an answer, put it back in your bag. If you really have to think hard about the next time you might, just might, use it… Throw it out. Go through the rest of the pile the same way, asking the same questions. Then repeat with the remaining piles. Take your trash bag out to the dumpster or trash can. Remove temptation to put anything back in your stash. If you find yourself missing something, go ahead and buy it again. If you miss it, then you probably do use it. Most people only need the basics for their daily routine: Foundation or powder, and mascara. You could ‘get by’ with those supplies. Eye shadow, blush, bronzer, lip color…. those are all nice, but you don’t need seventeen different shades of rose. Sometimes, simplicity really is the best option. You want to look put together, grown-up and professional. Find out your best colors and stick with them! They won’t betray you. Awww, now doesn’t that feel better?